Our Jaguar boating searches are a biologist’s tour de force. Photography: Mario Friedlander. Jaguars of Brazil’s Pantanal. Season: June to mid-November. Jaguar action is the same throughout this period. The coolest Jaguar-rich months are June, July and November; the hottest are September through mid-October. No air tickets are included, nor do we sell any. We recommend booking the intra-tour flights through your international carrier or Expedia. If you need an overnight in Cuiabá before the tour, we suggest booking your accommodations through priceline or similar hotel-reservation websites. Please land in Cuiabá no later than 12:30 pm; the group will leave no later than 2:00 pm. If your flight is delayed, you will have to pay for a separate, private transfer without a guide, and most likely your driver will speak only Portuguese. Please do not schedule a departure flight from Cuiabá for earlier than 11:00 am. Later arrivals or earlier departures will require separate transfers at additional cost. 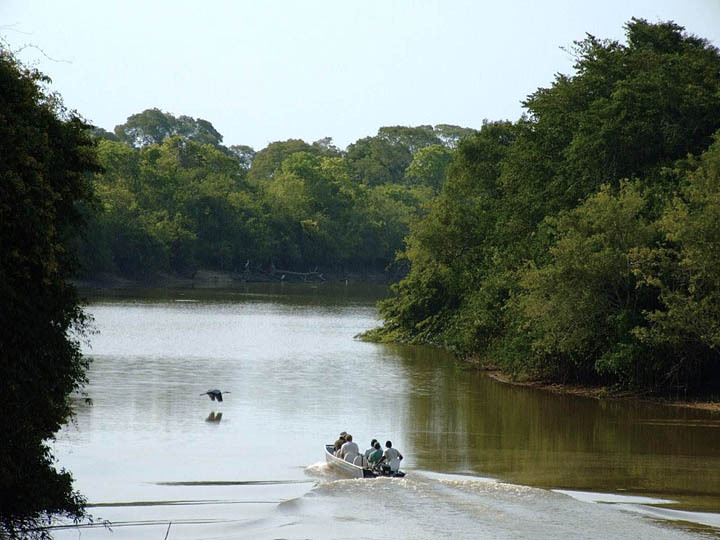 The return from SouthWild Pantanal Lodge is at 6:30 am, which is ideal for flights leaving Cuiabá at or after 11:00 am. Guests with later flights are welcome to relax in our air-conditioned office and use WiFi. The office is only a 6-minute walk or 3-minute drive from the airport. Flight arrival and departure times are flexible for our private tours, which include private transfers throughout. However, the earlier you arrive on the first day, the more time you will have for wildlife sightings along the Transpantaneira Road and at the SouthWild Pantanal Lodge. If you arrive in Cuiabá the night before, you can begin the Jaguar Extreme at 8 am. Free baggage allowances for flights within Brazil are 10 kg (22 lbs) for carry-on and 23 kg (51 lbs) for checked bags. The exception is TAM, which allows only 8 kg (17 lbs) for carry-on. Additional weight will incur an excess baggage fee. For maximum permitted dimensions of baggage and excess baggage fees, see the relevant pages on the airlines’ websites: GOL Airlines, TAM Airlines and Azul Airlines. Dr. Munn, our scientific advisor, has flown on hundreds of domestic flights in Brazil, and has never experienced a problem with his checked baggage. We don’t believe that any guest has ever had checked-in baggage stolen or permanently lost; we do believe the risk to be the same or less than in the U.S. The Brazilian Ministry of Foreign Affairs has created an Electronic Visa Program for citizens of the USA, Australia, Canada and Japan. With this initiative, visa application for Brazil will be easier and quicker. Consular services will be considerably more efficient. The foreign applicant may apply for the E-visa and obtain it remotely, through the website (www.vfsglobal.com/brazil-evisa), mobile or tablet application. The beneficiary must submit to the airline, in a first phase of the project, a hard copy or digitized image of the electronic visa in order to be able to embark for Brazil. The Brazilian E-visa will cost USD 40, substantially cheaper than the traditional visa, will have a maximum validity of two years and does not exclude the possibility of the applicant requesting a visa in the traditional way, through the Brazilian consular network. For residents of other countries, please consult with the closest Brazilian Consulate about visa requirements and fees. It is important to note that tipping is entirely voluntary and the amount given, if any, is at your discretion. However, because some guests ask for guidance, we suggest $10 per person per day for your guide and $10 per person per day for the staff. Tips in Brazilian Reais are recommended. $40 per person (160 Brazilian Reais) for the staff at the Jaguar Flotel (boat driver, kitchen staff and housekeepers), which can be given to your guide at the end of your stay at the Flotel, indicating that the tip is for the staff. $20 per person (80 Brazilian Reais) for the staff at the SouthWild Pantanal Lodge (kitchen staff and housekeepers) and $60 per person (240 Brazilian Reais) for the guide. You can give the tip to your guide on your last night at the SouthWild Pantanal Lodge, indicating how much is for the staff. The total would, thus, be $120 per person (480 Brazilian Reais). However, there is no magic number. It could be more or less depending on how you rate the excellence of the service that you received. If you are a non-drinker, we reommmend that you bring $120 per person (240 Brazilian Reais) for tips to your guide, boat driver, kitchen staff and housekeepers as advised above. If you are a drinker, you may want bring up to an additional $300 per person (600 Brazilian Reais) for alcoholic beverages and bar tips. While the SouthWild Pantanal Lodge and the Jaguar Flotel can accept dollars, to get the best rate, we recommend exchanging dollars with the official, uniformed baggage porters at the São Paulo airport. Most of them are found in the arrivals area, just as you depart customs. Their exchange rate is 8 to 13% better than the money-changing windows and banks at the airport. For greatest convenience, request bills of 20 Reais or higher. Unfortunately, they change only Euros and U.S. Dollars. We don’t want your experience to be diminished in any way. Don’t hesitate to speak up if anything isn’t as you wish. If your guide can’t solve the problem, please contact Arcana Mundi as soon as possible. Later on, it may be too late.